I'm not too well-versed on the rep of Frac modules. I've been poking around modular grid to see what's out there, but I'd love some first-hand advice. My needs are pretty small-- I/O, filter, delay, spring reverb, random modulation, and a clock divider. What are your favs for these categories? 1) I/O-- having an envelope follower onboard would rock. 2) Filter-- multimode would be great, but it's not a necessity. What is a necessity is that it's DIRTY. CV over resonance would be great too. 3) Delay-- I'm probably going to pick up a Time Machine, but what are your favs? 5) Modulation-- assuming my I/O has an envelope follower onboard, I really only need some randomness. What are your favs there? 6) Favorite spot to check out cases? 7) Clock divider? Dual would be great. 8) So is Bugbrand considered Frac then? For some reason I always that it was it's own format. Also, I'm thinking about getting a Korg SQ-1 for sequencer duties-- do I need to worry about the SQ-1's voltage for driving Frac modules? Not sure if the Blacet I/O module has an envelope follower on board, but Paia do a separate Env Follower module. Sounds like the Blacet Filthy Filter is what you need. The Time Machine might be a bit tricky to get hold of now, but it's worth holding out for one. You might need to go down the DIY route for that, or get someone to build you one. The Blacet LFO is one of the most versatile around IMHO, regardless of format. Blacet & Paia do metal racks, if you want a wood case you'd have to get someone to build you one. Metalbox build the CGS stuff, they have a couple of dividers (and will probably build you a custom version). Blacet have a really good dual voltage controlled divider. It's Frac in size & power, but most Frac uses minijacks rather than bananas. It's a good time to be looking into Frac, with all the new J3rk modules about to hit. Between Blacet, Paia & Metalbox there's already a good selection, add in what's available at Synthcube (who will be selling the new J3rk modules) and there's plenty to keep you occupied. I stepped out of the modular game. My machines have all used the Frac panel size - but always in my own custom frames (racks) as I could never abide the excessive depth, or the wasted cheek space of the two commercial frac racks (Blacet & Paia). Korg SQ1 - just get one - for the money they're amazing. Works great with such systems. Doesn't mean I'm ruling out ongoing patchable machines - but I can't see any imminent return to modular as it was for a multitude of reasons. thanks so much for all the suggestions! most helpful. bummed to hear no more bugbrand, tom! I totally understand about needing to move on to other projects though. good luck! i'm on your mailing list and I had my eye on the Spring Tank! Looks wicked. It sold out in no time! Speaking of springs, it's going to be hard giving up on Euro with the voltage controlled springs of Springray, and the readily accessible BBD delays. I recently picked up Pitts Analog Delay for $160. I might have to rethink this, since VC analog filter/delay/spring is what I'm addicted to. Is there any word on the street about any incoming VC spring reverbs or BBD delays for Frac? thanks again! Try Synthcube, they might be able to hook you up - they've got parts/PCBs for the Time Machine. The Blacet IO2225 does have an envelope follower (two separate envelopes, even). It's an extremely useful module - it's really fun to play guitar or bass through the I/O into the Filthy Filtre, for example. I used the hell out of that on the last thing I recorded. For noise/modulation: I am planning on DIYing the EAS clone of the MS-10 LFO/S&H/noise section - see here: https://www.muffwiggler.com/forum/viewtopic.php?t=95853 - which should easily fit in one Frac space (I even threw together a Schaeffer panel, which you can see in the thread, although I haven't had it cut yet). It's digital/DSP, but it has "BBD" and "tape" modes, which I guess changes the decay characteristics to simulate the analog delays. Also a lot of fun to fool with. I'm just about ready to finish building the first prototype for this guy. (waiting on a few parts to arrive) It won't be in the first batch of modules at Synthcube, but will likely make it into the second batch. The Metalbox Wave Multipliers is a must have module! Three independent Wave Multipliers that add intense harmonics to static waveforms. The primary multiplier has voltage control over the amount of folding, waveform offset, and pulse width modulation. With two inputs, a huge array of sounds can be had. The Grinder adds "ringing" harmonics to any input, sometimes reminiscent to digital aliasing. The Lockhart folder is designed to warp a sine into harmonically rich waveforms. Think of these three Wave Multipliers as "anti-filters" dramatically adding harmonics rather than reducing them. Whilst the primary and Lockhart multipliers are designed for use with raw waveforms, the Grinder is particularly effective on complex inputs such as drum machines. 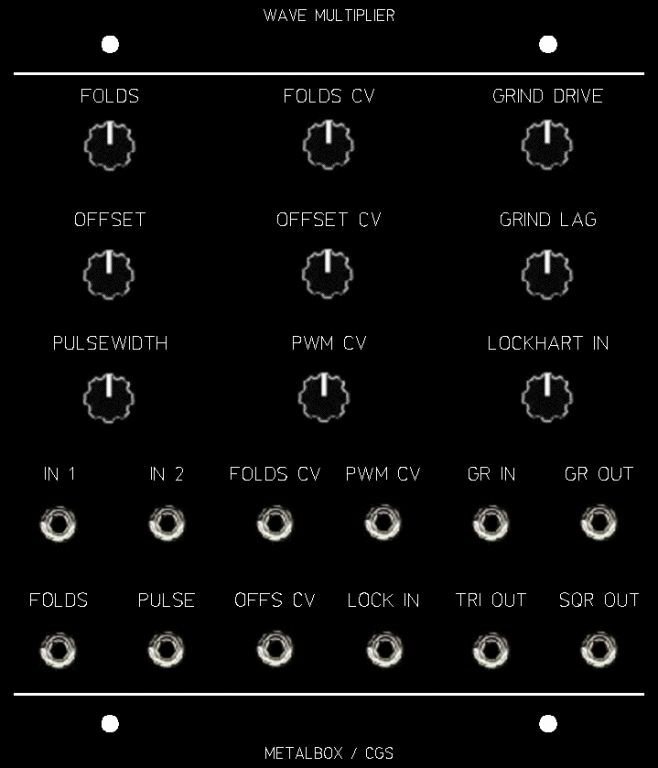 metalbox also make a version that's 4 modules wide but with a tube vca. I'd requested this so that it could fit into Bugbrand cases. It's an amazing module. I'd highly recommend you keeping an eye out for a Bugbrand Wavefolder.